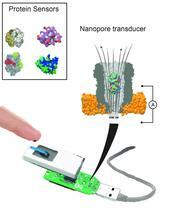 A nanopore device can contain different binding proteins. Once inside the pore, these proteins act as transducers to identify specific small molecules in a sample of body fluid. 09-Oct-2018: University of Groningen scientists, led by Associate Professor of Chemical Biology Giovanni Maglia, have designed a nanopore system that is capable of measuring different metabolites simultaneously in a variety of biological fluids, all in a matter of seconds. The electrical output signal is easily integrated into electronic devices for home diagnostics.